With the Genie Load Lifter, one person can easily lift, move and position heavy loads – helping to increase productivity. Compact and portable, it lifts up to 91kg to a height of 1.70m and stores easily with stowed dimensions of 1.10m x 0.38m x 0.52m. 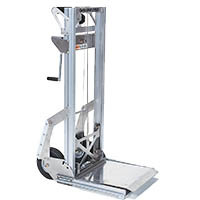 Use it to move everything from computers and electronic equipment to small appliances or manufactured parts.